Arizona workers’ compensation laws can be complicated. Get straightforward answers to ten common questions about rights, responsibilities, and benefits for both employees and employers. Do you have questions about workers’ compensation in Arizona? Continue reading to find answers to some of the most frequently asked questions from both employees and employers. Enjuris tip: For a more in-depth look at these and other workers’ compensation issues, take a look at our comprehensive workers’ compensation guide. 1. What laws govern workers’ compensation in Arizona? Arizona workers’ compensation is governed by the Arizona Workers’ Compensation Act (the “Act”) located in Chapter 6 of Title 23 of the Arizona Revised Statutes, and the Workers’ Compensation Practice and Procedure administrative rules (the “Rules”) located in Chapter 5 of Title 20 of the Arizona Administrative Code. The Act was enacted by the Arizona legislature; whereas the Rules were drafted by the Industrial Commission of Arizona (ICA) with the authority of the Arizona legislature. Both have the full force of the law behind them. One way to think about the difference between the Act and the Rules is that the Rules are meant to elaborate on the Act by providing additional details. Because of this, it’s best to start with the Act and move onto the Rules if you need more information. 2. What’s the first thing I should do if I’m injured on the job? It’s your responsibility to file a claim within one year of the date of your work-related injury. This can be done by obtaining a Worker’s and Physician’s Report of Injury at your doctor’s office and filing it with the ICA, or obtaining a Worker’s Report of Injury and filing it with the ICA. Once either claim form is filed, your employer’s workers’ compensation insurance carrier will be notified of the claim. At that point, the insurance carrier has 21 days to accept or deny the claim. Enjuris tip: Your employer is required to file an Employer’s Report of Injury. This isn’t the same thing as filing a claim. So, even if you learn that your employer has filed this report, you still need to file the Workers’ and Physician’s Report of Injury or the Worker’s Report of Injury. 3. 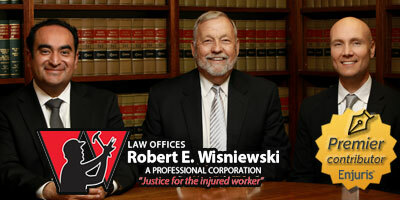 Can I hire an attorney to help with my workers’ compensation claim? Yes. At the very least you should consult with an attorney about your workers’ compensation claim. An attorney can ensure that you receive all the benefits to which you’re entitled. An attorney can also help with the appeal process in the event your workers’ compensation claim is denied. 4. What injuries and illnesses are covered? All injuries and illnesses (other than self-inflicted injuries and illnesses) are covered so long as the injury or illness arose out of your employment. An injury is generally not considered to have risen out of your employment it occurred at work but would have occurred anywhere. Along these lines, heart-related injuries, perivascular injuries, and mental-health issues aren’t covered in Arizona unless it can be proven that stress or exertion related to the employment was a substantial contributing cause of the injury or illness. 5. Can I select my healthcare provider? Your employer can require you to go to a particular doctor for a one-time evaluation. After that, you’re allowed to choose your own doctor in most cases. Enjuris tip: Workers’ compensation covers all reasonable and necessary medical treatment regardless of whether the doctor was chosen by you or your employer. 1. Am I required to carry workers’ compensation insurance? Enjuris tip: An employer may not require an employee to waive their rights to workers’ compensation as a condition of employment. However, an employee may voluntarily reject workers’ compensation insurance by providing a written notice to the employer, which must then be filed with the workers’ compensation insurance carrier. 2. What happens if I don’t carry workers’ compensation insurance? In Arizona, failing to carry workers’ compensation insurance has a number of serious consequences. If you fail to carry workers’ compensation insurance and your employee is injured, the employee can file a civil suit against you or file a workers’ compensation claim with ICA. If your employee files a civil suit, evidence of the injury alone is sufficient to find you negligent. If your employee decides to file a workers’ compensation claim instead, ICA will pay the claim and seek reimbursement from you plus a penalty of 10% of the benefits paid or $1,000 (whichever is greater). Even if your employee doesn’t file a claim, you can be assessed a fine of $1,000 for your failure to obtain workers’ compensation insurance. This amount increases to $5,000 for a second instance of being uninsured, and $10,000 for a third instance of being uninsured. What’s more, if you’re required to carry workers’ compensation insurance and don’t, your business can be shut down and you can be found guilty of a Class 6 felony. 3. What do I do if an employee is injured at work? You must also notify your workers’ compensation insurance carrier and ICA by filing an Employer’s Report of Industrial Injury. This has to be done within 10 days of learning of the injury. Enjuris tip: Depending on the circumstances surrounding the injury, you might have other reporting obligations under the Arizona Occupational Safety and Health Act. Talk with an attorney to learn more. 4. What if I don’t believe my employee was really injured on the job? If you don’t believe your employee has a valid workers’ compensation claim (perhaps you believe your employee was actually injured at home), you can object to the claim within 21 days from the date the claim is filed. Be sure to communicate with your workers’ compensation insurance carrier. Insurance carriers don’t want to pay claims that aren’t valid. If you have information you believe is relevant to the employee’s claim, pass it along to the carrier. 5. Can I be sued in lieu of a workers’ compensation claim? A workers’ compensation claim is generally the sole remedy for an employee who suffers a work-related injury. There are, however, a couple of important exceptions. First, an employee can reject workers’ compensation coverage. If an employee rejects coverage before the injury occurs, the employee retains their right to pursue a civil lawsuit against the employer. Similarly, if the employer fails to provide notice advising the employee of their right to reject workers’ compensation coverage, the employer retains their right to pursue a civil lawsuit. Second, if an employee is injured through the “willful misconduct” of the employer, the injured employee can file a civil lawsuit against the employer. Have more questions? Consider contacting a workers’ compensation attorney in Arizona.